The Jeweled Clusters in Maille Bracelet is a fun and fanciful bracelet to wear. For those who love to wear charm bracelets, this is the kit for you. 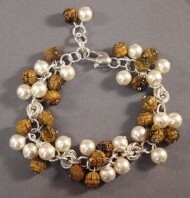 I utilized carved Tiger's Eye beads in combination with Swarovski pearls in the picture. You can choose any bead type and color to make a unique bracelet for yourself. This is a beginner weave with some beading techniques also. The clasp is not included in the kit.